It’s officially summer – that time of the year when the temperature is up, our hair is rarely ever down, and we are faced with the annual conundrum – how to stay cool and chic at once? And while (in the proverbial sense) we always want to be “cool” in the office, on weekends, or for that date night, summer forces us to mean it literally. But with a tried and true staple like the tank top, it can be easy to fall into a fashion rut while trying to ward off the heat. However, there’s no need to melt into a disheartened puddle just yet – I’ve figured out the best ways to style tank tops this summer that are as chic as they breezy. For us 9-to-5’ers, the idea of wearing a tank top on the job may seem outlandish. But, street style stars and businesswomen alike have proven it’s possible. By pairing a woven tank top with wide-cut trousers and mules, or even a nice dress pant, there is no need to sacrifice comfort for dress code. Or, if duty calls (or your boss does), slip on a light summer blazer for a polished meeting outfit. Still, outside of the office, it can be hard to find fresh ways to stay comfortable without sacrificing on style. 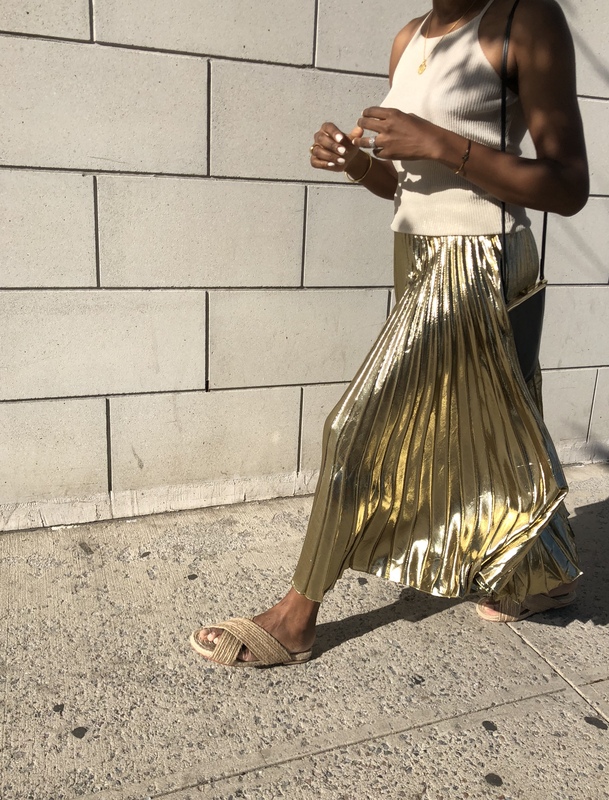 By maximizing on trends like the midi skirt, linen bottoms, woven top, or wide-leg pant, you get more bang for your buck and still manage to stay cool when paired with a tank top. Perfect for days off, styling a tank top with your go-to pair of jeans and some sneakers can add a casual yet summery touch to your weekend ensemble. To ensure your date-night or day-out outfit is up to style-snuff, opt for a slip or camisole top to get that sophisticated summer look. Don’t forget to add jeans and kitten heels to round it out. So, despite the rising temperatures, trying out some styling tips can help revamp your tank top collection and give the rest of your wardrobe new life for the summer. Check out some style ideas I’ve rounded up and comment below with your favorite way to integrate tank tops into your summer rotation! ps. Check out Karen’s video styling three tank tops this summer.